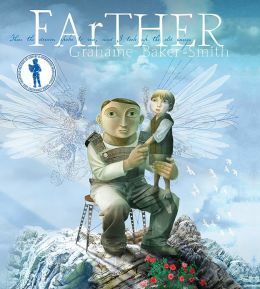 “Then the dream spoke to me, and I took up the old wings.” These words from the cover of Farther sum up the book nicely. This stunning book speaks to its readers about dreams and carrying on a family legacy. Grahame Baker-Smith won the Kate Greenway Medal, which is a British literary award for “distinguished illustration in a book for children;” and it is no wonder, for the illustrations manage to be both modern and enchanting. They boast detail and whimsy. This book sparks imagination for what is possible in the pictures alone. The text is dreamy and a little forlorn; evoking reflection. 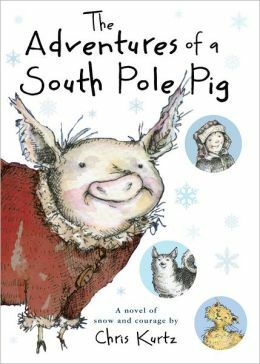 After reading this book, a class of third grade students may explore what exactly calls the narrator’s father away, both figuratively and literally. The illustrations are crucial for students’ comprehension, so this book may be better suited for a solo read, but the text is rather poetic for reading aloud. As a possible pre-reading assignment, students may look at the illustrations only and journal about their guesses about the story-line. After reading the book, students could journal about how their guesses matched up with the actual content. This book also offers a good place to start discussions about students’ dreams and hopes for the future, or about family heritage. Whether this book is used in a unit on family or dreams for the future, this book is a charming addition to any classroom. Who hasn’t dreamed of being a spy? 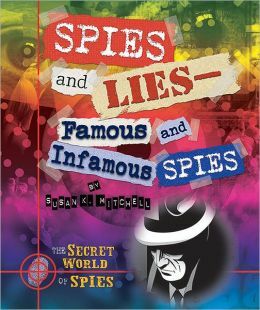 Spies and Lies: Famous and Infamous Spies, part of “The Secret World of Spies” series, shows both the rewards and perils of espionage and reminds the reader that the best spies were never discovered. The reality of spying may seem mundane to some readers when compared to Hollywood’s version of this profession, but the author manages to get some of the thrilling moments in her narrative. Third graders, who are starting to develop their own talents, will see how working with what you have is always best. Women often make good spies because they don’t seem threatening. Belle Boyd, a charming and beautiful woman, was a very successful spy for the South during the Civil War. She charmed information from Union troops and helped win battles for Stonewall Jackson. Legend says that, at one point, she ran across a battlefield to deliver information. Josephine Baker, Julia Child, and Marlene Dietrich are mentioned as other women with beneficial talents. Espionage has sometimes become a family business because then you don’t have to pretend with everyone. The Kuehns spied for Nazi Germany in Hawaii. They were only discovered because someone noticed they were flashing signals to the Japanese. The Walkers spied for the Soviet Union in U.S. And sisters, Ginnie and Lottie Moon, were two more Civil War spies. Sometimes, even children have been spies. Agnes Daluge was a very small thirteen-year-old when she began helping Jews leave Nazi Germany. Dicey Langston was a fifteen-year-old spy during the American Revolution. Information is still coming to light about Romanian children spying for the government during the Cold War. Even animals have been spies – birds, cats, and literal bugs. The table of contents, index, glossary, and “To Find Out More” section are valuable for comprehension of the concepts. The author included a short section about becoming a modern-day spy. 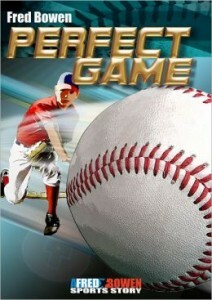 The publisher’s website, www.enslow.com, shows the other titles in this series and has a free pdf educator’s guide available, including many reading activities and reading worksheets. 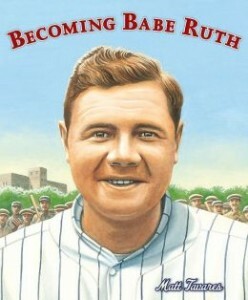 Very few Americans, even those not interested in sports, have never heard of Babe Ruth. So what makes this volume unique and valuable? The story focuses on Ruth’s early life and how he became the great baseball player rather than on his stats and behavior as a grown man. The phenomenal illustrations show not only the illustrator’s passion for baseball and for Ruth, but they also show Ruth’s passion for everything, including kids and eating. Ruth was sent to Saint Mary’s Industrial School for Boys in Baltimore when he was seven. He was considered incorrigible. He learned to pitch and bat at the school and he learned to work hard to attain his goals. Even after he was no longer an inmate, Ruth did a lot to help the boys at Saint Mary’s. In 1920, the school’s band traveled with the team. The reader gets a glimpse of life in the early twentieth century as well. The street and game scenes are particularly vivid and also show the physical attributes in the cities he played for. Because of the enthusiasm shown, third grade readers will be drawn into the tale of Ruth’s young life on the street and in Saint Mary’s. This book has already appeared on several reading lists, including receiving a Booklist starred review. The publisher’s website, www.candlewick.com, contains a lot of information about the author and about the book itself. As part of their “We Believe in Picture Books” campaign, the publisher is also posting videos by readers on www.readingstartshere.com. American Girl has a new series called Innerstar University. These stories are designed to give girls confidence in themselves and in the decisions they make. Each chapter begins and then the reader chooses which page to go to depending on their likes or decisions for different pathways and different endings. 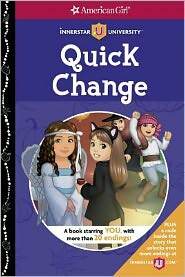 Third and fourth grade readers will enjoy these challenging stories. The reading level is specific to the grade level, but the comprehension is somewhat above the below average reader. It takes some understanding to follow to the pages with the different endings. Teachers should be aware that reluctant readers or those reading below the third grade level may have difficulty following the plot until they gain confidence in their reading ability. Teachers will find that girls will enjoy the books more than boys, making teachers on the lookout for a series of books for boys with the same skill levels for classroom libraries. The American Girl series for girls is designed to offer activity ideas for girls and they choose the endings to the stories depending on the hobby or interest each reader has. The endings can be quite different making this one book a possible of 20 stories with 20 different endings. This book makes a great addition for the classroom encouraging third grade readers to read for the pure joy of picking up a book. Once in a while there comes a sports story that is so much more than the usual story of wins and losses. Fred Bowen’s Perfect Game immerses his readers in the world of baseball: the preparation, the statistics, and then ever so gently lifts them out of that and into a world known to few children — the world of the Special Olympics Unified Sports. Isaac Burnett is an expert pitcher. The opening chapter clues the reader to his search for perfection. He dresses for the game, checking and rechecking in the mirror that“…everything was just the way he liked it. The socks. The pants. The shirt. And last but not least, the hat.” He steps out ready for the perfect game. What a perfect addition to any reading list! The back matter gives additional information about the 23 perfect games and the Special Olympics Unified Sports. There is enough matter to create many reading activities and discussion points. 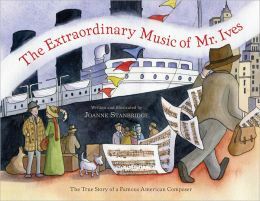 Extraordinary Music of Mr. Ives, written and illustrated by the talented Joanne Stanbridge, is aimed at readers at the third grade reading level and up. It is also the true story of an American composer who did not become famous for his work until well after he passed away. And, although his music was not understood in his day, Stanbridge shows us that it did not stop Mr. Ives from composing music that was often inspired by the hustle and bustle of New York City sounds such as: train whistles, traffic jams, honking cars, and noisy vendors selling their wares. The piece that put Mr. Ives on the map of musical composers originates with a slice of 1915 American history when an enemy torpedo sunk the ocean liner, the Lusitania. The tragedy silenced Americans and hushed the sounds of New York City life, as well as the music that lived inside Mr. Ives. Eventually New Yorkers in Hanover Square North began to express their feelings by singing an old tune, “In the street bye and bye, we shall meet on that beautiful shore.” These words stirred Ives to compose. He rushed home and spent the entire evening trying to capture the mood of that moment. He took their song, wove in city street sounds, and named his new piece From Hanover Square North, at the end of a Tragic Day, the Voice of the People Again Arose. More than fifty years later, and thirteen years after Mr. Ives’ death, From Hanover Square North was performed and became a huge success. At long last, people began to understand Ives’ music and to listen to it. The biggest compliment to his work comes from other admiring musicians. They mimicked Ives’ boldness in their own compositions. Stanbridge dedicates a page of illustrations and text to three of Ives’ fans: Elliott Cook Carter’s Pocahontas, Aaron Copland’s The Tender Land, and John Adams’ On the Transmigration of Souls. The Extraordinary Music of Mr. Ives is a nonfiction picture book that would be appropriate for third grade readers and up. It is also an ideal book to add to all school libraries and classrooms for discussions about events like 9/11. Stanbridge’s picture book is a compelling look at how people came together to mourn and offers a positive response to healing. Eew! That smell of dirty socks? It’s actually the hippopotamus hiding in the closet. Quick, how do we clean the hippo and get rid of that smell? Now we have a book that tells us. 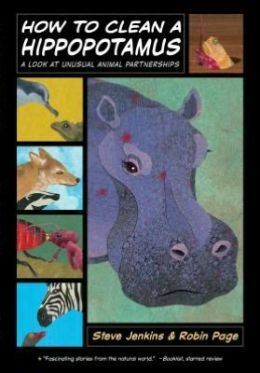 Young readers will be enticed by its unusual title: of course they want to know how to clean a hippo, and in reading the book they’ll learn all about symbiosis in the natural world. The back matter tells us that there are many kinds of symbiotic relationships in nature. 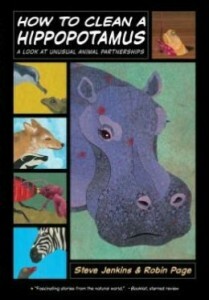 In this book we learn about mutualism: a partnership which benefits all the animals involved. The hippo, for example, spends most of the day in the water. Algae and water plants make its skin slimy. Enter the African helmeted turtle who nibbles away at the slime. In return, the cold blooded turtle rides on the hippo’s back, warming itself in the sun. The book is filled with fascinating facts. Clownfish and sea anemone have a symbiotic relationship. But we learn how, to begin with, the clownfish are not immune to the sea anemone’s toxin. They build that immunity over time, slowly exposing themselves to the stinging tentacles till their body adapts to the toxin. Do they become immune to all sea anemone? No. Only to the anemone they interacted with. And if they are away from the anemone for more than 45 minutes they have to start the process of building up immunity all over again. Third graders, even middle schoolers, will be enchanted by this collection of facts. Teachers can schedule reading activities and reading games — the graphic novel format lends itself to many activities. The book is rich in resources: in the back matter the authors provide additional information (size, habitat and diet) about all the animals mentioned in the book. The Adventures of Jo Schmo and Dinos Are Forever is a fun, exciting, and engaging chapter book for 3rd grade level readers. It has an interesting character that will grab the reader, even a reluctant one, from the very first page because the action and adventure begin right from the start. Third grade level readers will master the reading alone and advanced third graders may also find success with the assistance of wonderful graphic illustrations throughout to emphasize the scenes. The book is a great classroom book to read together because it offers the teacher an opportunity to encourage discussion and imagination with each student. A great additional activity would be to encourage students to write their own adventure chapter book with illustrations making this an extra opportunity to teach reading and writing. The Adventures of Jo Schmo- Dinos Are Forever introduces the reader to fantasy and learning what is true and real and what is not, offering another great opportunity for teachers to instruct about fiction and nonfiction. The story is a great example of a fantasy graphic chapter book for the third grader. Following Jo Schmo as she becomes a detective and tries to solve crimes in her city, and as she becomes a superhero saving lives and solving mysteries, will keep both boys and girls at this reading level engaged and turning the page. The illustrations serve to aid in reading comprehension making this a win- win for both students and teachers when added to the classroom selection. 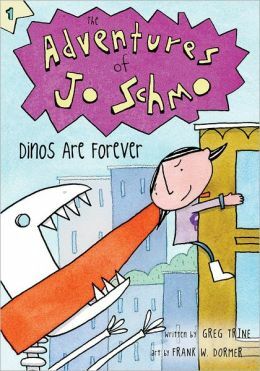 As budgets get cut, it can be difficult to decide what books to include for third and fourth grade level readers but The Adventures of Jo Schmo would be one to include. It is both engaging and interesting and just plain fun for this reading level. Kudos to Greg Trine for writing a book that kids will love to read. Flora the pig is descended from a long and reputable line of porcine adventurers/philosophers. Just goes to show that dogs, smart and loyal as they are, are not the only non-human species with human-like thoughts and desires. Flora, like Jonathan Livingstone Seagull, feels that there is more to life than searching for food. When Luna the cat comes by Flora is awestruck. Here is a creature who has seen the world beyond the confines of the pen. Flora badgers her for stories, and translates the stories into games she teaches her siblings. Circumstances conspire to set Flora off on a grand adventure. The title reveals where Flora and her ‘team’ are headed — the South Pole! This book is a wonderful read aloud, a chapter at a time. It can lead to discussions about the South Pole and life in that remote frozen land, and talks about the adventures and misadventures of the famous explorers who journeyed to the Antarctic. Flora is equal parts adventurer and philosopher. “Why aren’t farm pigs in control of their lives?” she asks Luna, her friend and mentor-cat. She is willing to learn, to ask questions. “Is that some kind of special blanket?” she asks, when she sees the men spread a square of canvas on the snowfield. Jennifer Black Reinhardt’s black and white line drawings add just the right note of whimsy. A great addition to any reading list. Just Grace and the Double Surprise is a joy to read for the third grade reader. It has many illustrations and the paragraphs are broken up on the page so the third grade reader will not get bored reading about the fun that Grace and her friend Mimi experience.